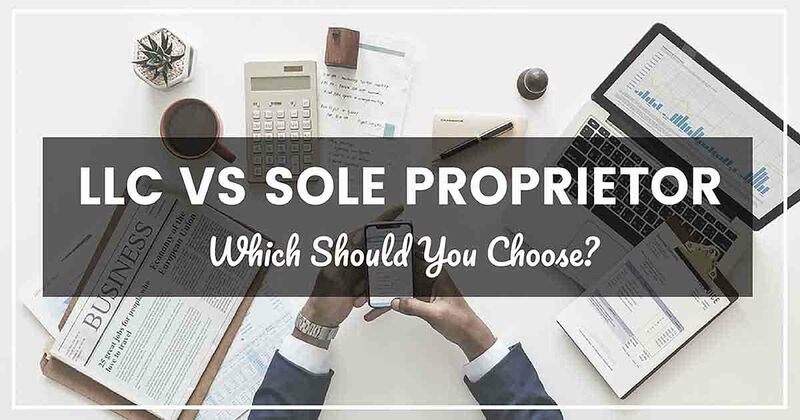 LLC vs Sole Proprietor Which Should You Choose? LLC vs Sole Proprietor: Which Should You Choose? If you are starting a new one-person business you may be wondering whether you should classify your business as a single-member limited liability company (LLC) or as a sole proprietorship. There are several advantages and disadvantages to each option, and depending on what your plans are for the company, one or the other may be a significantly better option for you. This guide will look at the pros and cons of a single-member LLC and a sole proprietorship and help you determine which option is right for you and your business. A sole proprietorship is the most common business structure and the simplest to form. Sole proprietorships are unincorporated businesses. Legally speaking, there is no distinction between you and your company. The best part is that this status is automatic — if you are the sole owner of a business, you become a sole proprietor simply by conducting business. If you’d like to operate a sole proprietorship using any name other than your given name, you’ll need to acquire a DBA (or “doing business as”) name. This will allow you to use an assumed name to enhance the credibility of your business, and provide some privacy protections. Tax season is also simple with a sole proprietorship. Because the business is not separate from you as a person, any business income or losses are claimed on your personal tax return — there’s no need to file a separate business return. Another option for a one-person business is the single-member limited liability company. The main advantage of the LLC is the fact that it provides personal asset protection, which means that creditors cannot pursue your personal money or possessions in a potential lawsuit. This is possible because, unlike a sole proprietorship, the government views an LLC as a separate entity from its owner. Starting an LLC does require business owners to file articles of organization with their state to officially form their business. In addition, there are continued state requirements, filings, and associated fees that your business must comply with in order to maintain its LLC status. For tax purposes, a single-member LLC is essentially the same as a sole proprietorship. Although, as a rule, your personal and business assets are kept separate, the IRS allows LLC owners to report business profits and losses on their personal tax return. Whether a sole proprietorship or an LLC is the right choice for your business will depend on a number of factors. Below are some advantages and disadvantages of each to help determine which is right for you. Easy to Form and Maintain: As mentioned earlier, unlike an LLC, which requires business owners to form their company with the state and conform with state regulations and guidelines, there is essentially no setup or maintenance work required to form or maintain a sole proprietorship. No Fees: Other than the one-time cost for a DBA (if you choose to have one) and any applicable business licenses or permits, there aren’t any startup or maintenance fees involved with sole proprietorships. On the other hand, most states will charge a fee to form your LLC, along with fees to file annual or biennial reports depending on state regulations. No Need to Separate Personal and Business Income: Since a sole proprietorship is treated the same as an individual, there is no need to keep your personal and business assets separate. For example, your business income can go straight into your personal bank account. With an LLC, however, your business and personal assets should never be combined. If you fail to maintain this distinction, you risk losing your limited-liability protection, which is the main benefit to owning an LLC. Personal Asset Protection: The main advantage of an LLC is the way it limits your personal liability to the amount you invest in the company. If your business is sued, your house, car, and personal checking account are off-limits to creditors. This is not the case for a sole proprietorship. Since you are indistinguishable from your company, you retain responsibility for any debts accrued. Easier to Raise Capital: Unlike sole proprietorships, LLCs offer owners the opportunity to sell shares of their business in exchange for investments. This can be an excellent way to raise capital when needed. Additionally, it’s often easier to obtain a business loan since the business is a distinct entity from its owner. Easier to Transfer Ownership: Since LLCs are distinct entities run by the owner of a business, it’s fairly easy to transfer ownership from one person to another. A sole proprietorship, on the other hand, is more difficult to sell since the business assets are rarely distinct from the owner’s personal property. If a sole proprietor wishes to sell their business, they must first separate all business assets and property from their own. This includes items such as computers, vehicles, and office supplies that are often used for both business and personal reasons. This can make it much more difficult to value and sell your business. Ability to Form in Any State: While many LLCs only operate, and thus register, in their state of residence, those who conduct business in multiple states are permitted to select any state as their “home state” for filing purposes. This flexibility allows business owners to choose a state with the most favorable business climate, taxes, and regulations, which can save a great deal of time and money. Since sole proprietorships don’t face the same filing requirements as LLCs, there is no distinction when it comes to their state or states of operation. In general, if your company engages in activities that generate any sort of financial risk — especially those that can’t be mitigated by insurance coverage — an LLC may be the best choice for you. While it can be more labor intensive and costly to set up and maintain, the personal asset protection alone is often well worth the costs incurred. On the other hand, if your business is fairly simple and risk free, a sole proprietorship can be an excellent way of doing business without taking on any extra regulatory or financial burdens.